This report covers the advantages of light emitting diode (LED) light towers over metal halide light towers. In particular, the paper expounds on a range of competitive criteria, including energy-saving properties, power usage benefits, heat dissipation and long-term maintenance. The insights found in the report are applicable to business owners, engineers and lighting specialists. Through the study, readers will be able to clearly characterize the specific uses of LED and metal halide light towers. The conditions required for the application of each system will also be covered to ensure best practices for handling and safety. Larson Electronics brings decades of firsthand experience in working closely with light tower products. The company caters to the needs of customers by providing customized industrial lighting solutions for various industry-specific projects. This report displays the establishment’s dedication and high-level expertise in the delivery of commercial light towers, from the early stages of product offering and recommendations to complex installation and daily maintenance. Work safety starts with adequate lighting, especially for on-site projects that involve construction, road repair, demolition, mining, movie production and remote rescue operation. A common trend that caters to this need is the installation of industrial light towers. 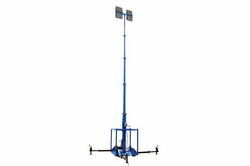 The mobile equipment entails the use of several high-powered lamps that are attached to a sturdy mast for support. Some light towers apply an inflatable mast that also serves as a diffuser to improve the lamp’s illuminative qualities. A generator, which is powered by a diesel engine or large batteries, push power to the lamps. Recently, new eco-friendly designs with solar panels have also made its way into the market. The main feature of light towers is portability. Businesses can easily transport (using a trailer, cart or manually by hand), deploy and adjust the lights seamlessly, without causing major disruption to the ongoing project. The two primary lighting technologies that contractors have to choose from includes metal halide and LED. Out of the two options, metal halide towers have been around far longer, with the industry standard being the 1,000-watt version at 110,000 lumens per lamp. Such products usually feature a lamp, ballast and capacitor. One of the major drawbacks of the lights is the “start up” period required to achieve full brilliancy (5-20 minutes, depending on the lamps). It is important to consider that restarting metal halide lights cannot be done instantly, and may take 15 minutes (or longer) to complete the entire process. The introduction of LED technology in light towers have added value to the development of the equipment. Such lamps offer long lifespans (up to 50,000 hours) with instant toggling (no warm up or cool down required). The light produced by LED lamps are also clearer and produce less glare, compared to metal halide products. Moreover, LED lights offer up to 40 percent in fuel savings. This enables businesses that incorporate multiple light towers on a regular basis to better manage operational costs. On the contrary, companies that rarely use the towers may not immediately recognize the cost-saving attributes of LED lamps. Metal halide light towers rely on metal halide lamps for its illuminative features. The fixture is characterized as a high-intensity discharge (HID) lamp that generates light from an electric arc within a discharge tube. A mixture of vaporized mercury and metal halide salts help produce the intense light inside the quartz arc tube. It’s important to consider that (unlike florescent fixtures) the lamps do not use phosphor to generate light. When turned on, the ballast pushes a high voltage to the starting electrode and through the tube, which ionizes the argon gas. During the initial start up period, the tube emits a blue color. To meet the temperature requirements (1000-3000 Celsius) of the halide salts, the ends of the tube are coated with white ceramic. This reflects heat back into the light for an even white color that closely resembles natural sunlight. Over 75 percent of the energy produced by the lamp is used to make heat, while 25 percent is used to generate the actual light with a ranging color temperature of 1,800K-10,000K. One of the biggest disadvantages of metal halide lamps is the waiting period to full light output. Typically, the warm up process takes 5-15 minutes to achieve 90 percent output. At full output, the lamp cannot be toggled instantly. The fixture must be cooled down considerably before toggling, or the lamp will not restart. Restrike times usually take around 15 minutes or longer, depending on the type of lamp. Metal halide lamps have a lifespan of 20,000+ hours, which is over 10 times longer than incandescent lights. Compared to mercury vapor (35-58 lm/W), florescent (30-98 lm/W) and incandescent (15-35 lm/W) lamps, such units offer higher efficiency at 65-115 lm/W. A benefit of using metal halide lamps is the low electrical power required to generate high quality lighting. As a result, the fixtures have made its way into mainstream applications, ranging from large-scale outdoor projects to indoor stadium lighting. Maintenance for metal halide lamps can be meticulous, especially for businesses with high lighting consumption rates. Because the fixtures rely on ballasts, it is crucial not to run the bulb until it completely burns out. Doing so will damage the ballast and may require more maintenance. In most cases, the lights display a series of signs when they are ready to be replaced. The first and most obvious sign is a color shift. Long periods of consumption will naturally cause the lamps to turn slightly pink from expired metal vapors that build up due to continuous heating and burning. At this stage in the lifespan, the lamp is experiencing a decrease of 40 percent in light output. When a lamp turns light or heavy green, it usually means the capacitor needs to be addressed. The color shift is due to the gases in the arc tube not reaching optimal operating temperatures. Replacing the capacitor will fix the issue, depending on the lighting system. The more a metal halide fixture is used, the greater the load required to maintain illumination. This often results in the lamp cycling on and off, or a prolonged start up time. The issue arises from the high levels of heat produced by the unit, which causes the liquid gel filling inside the capacitor to crystallize. The lamp receives an unrestricted current from the delivery of higher current, and the lights turn brighter and turns off. At the end of the cycle, the thermal component cools and resets. The cycle repeats and may cause the arc tube to turn black. A solution for the issue is to replace the ballast, capacitor and lamp. Compared to LEDs, majority of metal halide component failures are caused by lamps. While most LED component failures come from the driver or power supply. Under consistent maintenance, it is common for metal halide lighting systems to last an average of 20,000+ hours or five years (outdoor lighting) with ballast failure at 10-20 percent over ten years. Indoor metal halide fixtures typically last approximately 100,000+ hours or 15 years with 3-4 lamp and 10-20 percent ballast changes. Failure of the entire units for both outdoor and indoor applications are rare. LED light towers incorporate LED lamps to illuminate various locations. Such lighting equipment rely on a solid state design that ensures its sturdiness under extreme working conditions. Instead of filaments, glass and toxic chemicals, the fixtures use chips to produce light. As mentioned earlier, LEDs can save up to 40 percent of energy compared to traditional lighting options. Under optimal conditions, such lamps reach up to 80 percent efficiency with an average of 60-70 percent. By comparison, metal halide units average roughly 50 percent energy efficiency during the conversion of electrical power to light. It is important to consider that metal halide lamps require the use of reflectors to prevent the loss of light, and maximize light radiation. This configuration often results in lumen losses due to diffusion and absorption. LEDs do not use the same type of setup (no reflectors are needed) and lesser watts are required to produce the same amount of lumens. Naturally, this results in less power requirements during operation, which translates to more power available for businesses to allocate around the jobsite. An example of this energy-saving feature comes from the city of Sacramento, California. In 2011, the city replaced its metal halide lights inside a 180,000 square foot parking garage with LEDs (equipped with occupancy sensors). The installation resulted in an energy consumption decrease of 88 percent, amounting to $34,500 in annual savings. Maintenance for LED lights are not as demanding, compared to metal halide lamps. The initial costs of LED equipment are generally higher than metal halides; however, when factoring in maintenance (new pieces, labor and time) LEDs offer more savings in the long term. LEDs have a superior lifespan of 50,000+ hours, which is over five times more than metal halides. During failure outside of its lifespan, businesses must take a range of factors into consideration. In addition to LED packages, optics, wires, connectors, seals and thermal management components could lead to product failure. The benefits of LED technology in industrial light towers are numerous. Unlike metal halide lamps, LED lights can be toggled instantly. There is no waiting period during start up, and operators have the option to toggle the lights any time while working. This offers greater flexibility on the jobsite, allowing workers to make adjustments to the lighting conditions of the area without minor delays. Furthermore, full power is achieved almost immediately. LEDs possess several eco-friendly benefits for businesses, due to their ability to cut down energy costs. The fixtures do not use toxic chemicals, such as mercury and lead, to produce light. As a result, the units are easily recyclable and do not require sensitive handling during disposal. This also makes the lights safer to use on the jobsite, and greatly lowers health-related risks during accidents in the workplace. LED light towers are easily transportable over rugged terrain. They can be setup seamlessly, in over half the time it takes to install permanent lighting fixtures. Power options for such equipment vary, from fuel to batteries. A rising trend in the development of light towers is the incorporation of solar energy features. Solar LED towers can help reduce operating costs by using solar panels to charge batteries. Hybrid units that offer both diesel and solar options can make the application of light towers more sustainable. Less fuel trips are required to keep the fixtures running, and with more power options available, projects can continue into the night without interruptions. This type of LED light tower was first introduced in 2010 by Progress Solar Solutions. Such units do not need to be positioned away from the focus of the work due to its ability to limit noise and exhaust fumes during operation. Larson Electronics (LE) offers a selection of industrial light tower solutions for businesses and large-scale, commercial projects. The company presents both LED and metal halide models with a variety of mounting options. Going beyond the standard selling of commercial lighting equipment and power accessories, LE also provides customized solutions for establishments that need specific lighting requirements for their facility or project. In addition to light towers, the brand boasts an extensive catalog of industrial lighting products, from UV lights and boat spotlights to explosion proof lights and high bay LED lighting. LED light towers offer low maintenance, energy-saving features and durable design, making them more advantageous for high risk, large-scale operations, compared to metal halide light towers. Such units are versatile in meeting the demands of various fast-moving sectors, such as construction, oil and gas, military, sporting events and security. Added flexibility when using LED light towers provide safety for workers on the jobsite. Although the products cost more initially than metal halide light towers, the extensive lifespan and the unit’s ability to withstand rough treatment, makes the option superiorly cost-effective in the long term. Lastly, new trends in the space supports the heavy energy consumption of the light towers through the application of solar technology. Such developments have ushered in special types of units that consume less fuel, but can also function without full reliance on sunlight for energy (fuel/solar hybrids).